Columns Name The name of the input column. VARIANT: A flexible type that can be used for any purpose. Data Type For more information on available BQ datatypes please refer to the Google Cloud documentation. String: This type can hold any type of data, subject to a maximum size. Integer: This type is suitable for whole-number types (no decimals). Float: This type is suitable for numeric types, with or without decimals. Boolean: This type is suitable for data that is either "true" or "false". Timestamp: This type is a timestamp left unformatted (exists as Unix/Epoch Time). Generates series of static select statements that return the entered values. 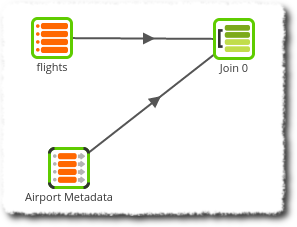 This job uses a Fixed Flow Component to embellish the name and country of the airport onto the raw flights data. Note: The Map Values component should also be considered in this scenario and is likely to be more efficient. The table name is set first. Then the user is prompted to set at least one Column, then the values are set of those columns. Columns are added with an appropriate data type. Data is then entered a row at a time for the set columns. The Sample tab shows the table that has been created.